Stand close to the load with your feet spread about shoulder width apart, with one foot slightly in front of the other for balance. Squat down, bending at the knees (not your waist). Tuck your chin while keeping your back as vertical as possible. Get a firm grasp on the object before beginning the lift. Slowly begin lifting with your legs by straightening them. Never twist your body during this step. 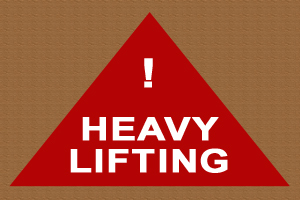 Once the lift is complete, keep the object as close to the body as possible. As the load’s center of gravity moves away from the body, there is a dramatic increase in stress to the lumbar region of the back.